Here is an angel card to guide your day. 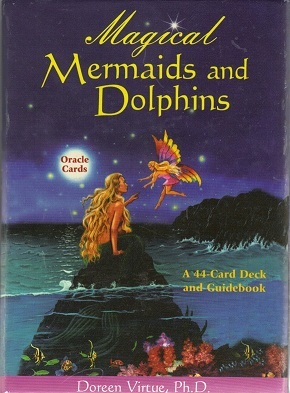 I am using my favorite deck, Doreen Virtue’s “Magical Mermaids and Dolphins.” Whenever you may read this, the message is for you now. And my reading for you – This is one of my favorite cards, because it says, “Don’t quit right before the miracle occurs.” I love that, because it means the miracle is right here. And it’s a miracle. Which is pretty much my favorite thing ever. Yours too, right? It also says, don’t quit, but I want to add this twist: Don’t quit, but do surrender. Don’t quit hoping, don’t quit believing in miracles, but do surrender to all possibilities, do stop wishing so hard, do stop holding your mouth just right in hopes that it will make exactly what you want happen. Remember–and this is so important–what you want may not actually be what you wind up liking. Get it? For example, what if you wanted a new car, and you really, really wanted a candy-apple red Mercedes with black leather interior, and you held so tight to that desire that nothing else could come in? But if you would let go of that hard wishing, and surrender to all wonderful possibilities, the Universe just might bring you a Lamborghini. So, in summary, stay optimistic, a miracle is coming, don’t quit, but do surrender.